We are very excited to share the upcoming Adventure Goddesses Kiteboarding and Yurts Weekend Getaway being held at Flora Bora. The weekends are Feb 8-10 and March 8-10. 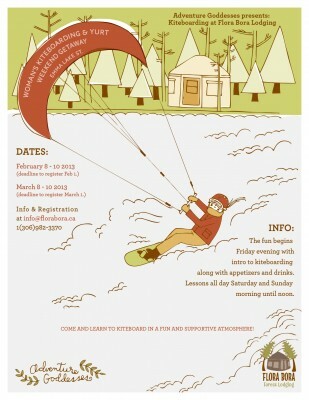 The fun begins on the Friday night with appetizers and drinks along with an introduction to kiteboarding. The lessons start Saturday morning and run all day , with festivities wrapping up Sunday around noon. Come and join us on beautiful Emma Lake, as we catch some wind with your fellow Adventure Goddesses! To register and for more info. email me at karen@florabora.ca. This entry was posted on Thursday, January 24th, 2013 at 8:19 am	and is filed under Uncategorized. You can follow any responses to this entry through the RSS 2.0 feed. You can leave a response, or trackback from your own site.